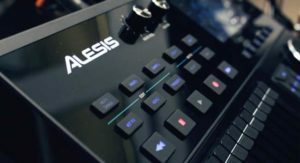 While designing the Strike and Strike Pro kits, Alesis engineers had two goals in mind: to provide drummers with their most powerful module yet, and to make an electronic kit that finally delivers on the promise of feeling like a real acoustic drum set. 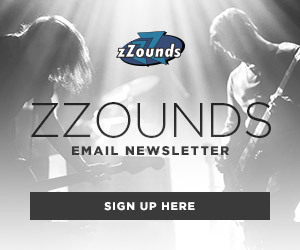 Josh Cuadra, Alesis National Sales Manager and Dan Recchia, Alesis Project Manager, recently paid us a visit at zZounds HQ to demo Strike and talk about the development process and the design considerations that went into it. Read our interview below to learn more on how this game-changing kit came to be — and hear it for yourself in our demo video above! With that in mind, the team began conceptualizing Strike as having a module and sound engine that could take drummers to new places, plus give them the feel of real wood shells and a full-sized kit to bring out their best playing. While crafting the Strike module’s 110 drum kits and 1600 multi-sampled instruments, the developers sought out to make kits that not only sounded great on their own, but in the context of a song or live band mix. Sometimes, the “song route” means literally trying to capture the essence of a famous drum part. Recchia cited John Bonham’s iconic opening to “When the Levee Breaks” as one such example. “You just have that 8-second part on the track where ‘oh, there it is,’ everybody knows what that is. 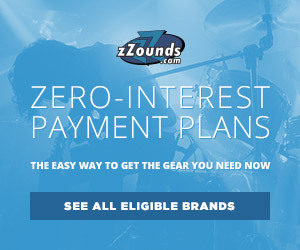 People have spent thousands of dollars buying this exact drum kit and those cymbals,” he said. Whether someone wants to nail the exact tone of their idols for a tribute band, or take the “Levee” sound to new places with their own ideas on Strike is up to them. Adding your own sounds is a breeze — simply upload them to the module on an SD card, or use the on-board sampler. The software editor gives you everything you need to create custom kits and instruments. Each kit on the Strike module hosts layers upon layers of sampled sounds, from kick drums to hi-hats. 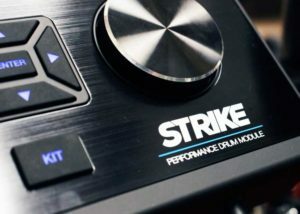 That’s nothing new when it comes to electronic drums, but where Strike stands out is in the sheer number of samples it can run — and the resulting richness of its sounds. “There’s never been a drum module just specs-wise where you can have x amount of velocity layers and round robin or cycled samples — which are the two ways you make realistic and expressive drums — there’s never been a module that can hold and function with as many as ours,” Recchia said. 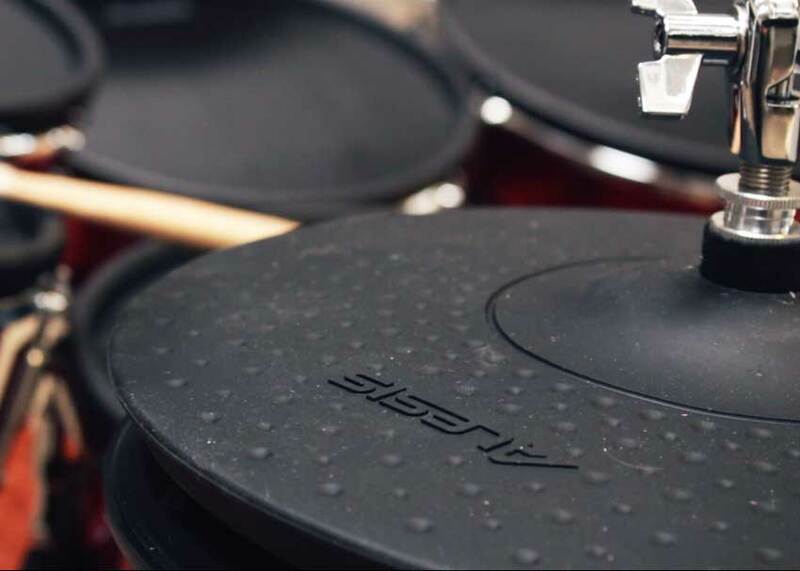 Some software libraries can hold as many as, or more samples than the Strike module, but when it comes to the sample richness of other electronic drum modules, Recchia says Strike is far ahead of the competition. When drummers try an electronic kit, one of the areas they’re most critical with — and rightfully so — are the cymbals. With as much sustain as a heavy ride or crash can have, the amount of space needed to store layers upon layers of sampled cymbals can be prohibitive. Another factor Alesis wanted the Strike cymbals to nail was seamless transition between zones in the cymbals. The crashes are each dual-zone, with different response and tones for the edge and bow, and the ride is three-zone with edge, bow and bell sections. 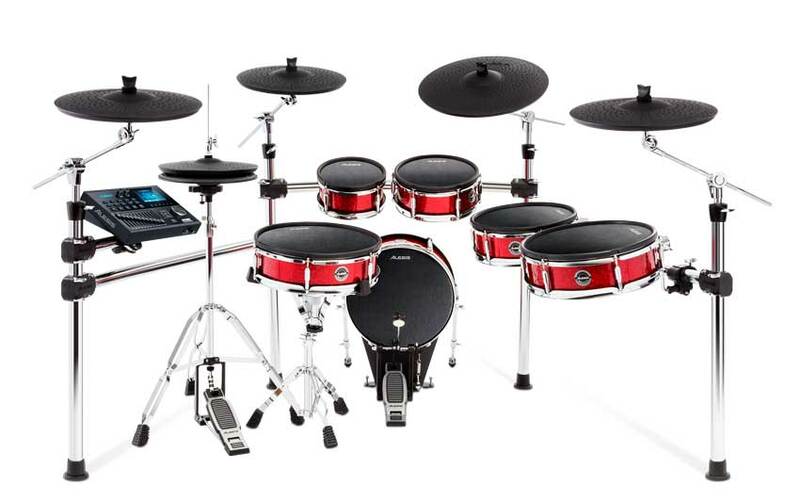 The first thing most notice about Strike is its look — the bold red shells signal right away that this is not your typical electronic drum set. And once you sit down to play Strike, you realize what lengths Alesis engineers went through to make this a truly real kit. 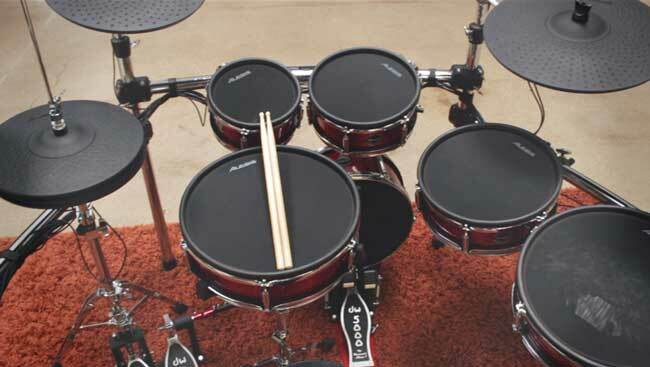 The 14″ kick, 14″ snare, and 8″, 10″, 12″ and 14″ toms were designed to feel like home to acoustic drummers. The Strike shells are made from birch and cottonwood, which not only contribute to the authentic feel, but help reduce crosstalk and dampen any unwanted resonance. “When you talk about drum sizes and having real drum sizes that feel real, that are made out of real wood, it makes the drummer comfortable, and comfortable musicians are creative musicians,” Recchia said. One thing the team doesn’t want drummers to think about when they think about Strike: having to make huge adjustments to the kit to fit their style, or adjusting themselves in order to play an electronic kit. The Strike’s toms, snare and kick are all full-sized and made from birch and cottonwood. The sturdiness of Strike is apparent right away. You can lean into the kick drum without feeling like you’re going to kick it over. 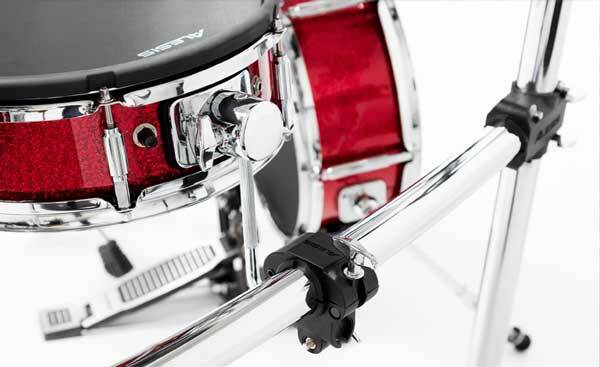 The mesh heads on the toms and snare provide that realistic response. If, comfortable musicians are more creative musicians as Recchia suggests, we expect to see some incredible performances from behind Strike kits everywhere.